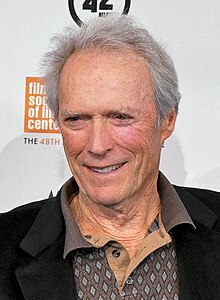 Clint Eastwood (born May 31, 1930) is an American actor, movie director, producer and composer. Eastwood was born in San Francisco, California on May 31, 1930. He was nicknamed "Samson" by the hospital nurses as he weighed 11 pounds 6 ounces (5.2 kg) at birth. Eastwood is of English, Irish, Scottish, and Dutch ancestry. He was raised in Piedmont, California. He studied at Piedmont Junior High School and at Oakland Technical High School. He has appeared in many movies since the 1950s. The most famous are the Dollars trilogy of Spaghetti Westerns (1964–1966), Dirty Harry (1972), Any Which Way You Can (1979) and similar movies. Eastwood also won critical acclaim as a director with the movies Unforgiven (1992), Midnight in the Garden of Good and Evil (1996), Space Cowboys (2000), Mystic River (2003), and Million Dollar Baby (2005). In recent years, Eastwood directed biopic movies such as American Sniper and Sully. Eastwood was married to Maggie Johnson from 1953 until they divorced in 1984. They had two children. Then he was married to Dina Ruiz since 1996. They have one child. He now lives with his family in Carmel-by-the-Sea, California. He was the mayor of Carmel-by-the-Sea for two years, starting in 1986. ↑ Amara, Pavan; Sundberg, Charlotte (May 30, 2010). "Eastwood at 80". The Independent. London. Archived from the original on January 16, 2011. ↑ Day, Elizabeth (November 2, 2008). "Gentle Man Clint". The Guardian. London. Archived from the original on January 16, 2011. Wikimedia Commons has media related to Clint Eastwood. This page was last changed on 22 October 2017, at 16:14.